The Brother DCP 310 is an amazing flatbed printer with several excellent features. From a print speed of 20 pages per minute to a 16 MB standard memory, it works well in many environments, such as family homes, where occasional yet reliable printing is required. However, the lack of a large and intuitive control panel screen and the absence of a fax system lets it down. Despite its versatility, some of its features are not great compared to the market standard. As a product from leading firm Brother, it’s not surprising that the DCP 310 comes with a wide range of top design features. For example, it has a print resolution of 1,200 x 6,000 dpi, while it also has an interpolated scan resolution of 19,200 dpi. It measures 49.8 x 44.4 x 19.8cm, while it can print from a variety of external media, including memory sticks, SmartMedia and more. There are plenty of advantages to opting for this printer. For example, it comes with a decent amount of memory (16 MB). 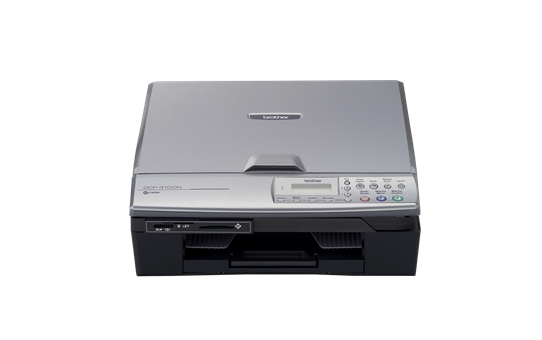 It has a paper input capacity of 100 sheets, meaning that you won’t need to top up the paper tray regularly if you engage in light-to-medium usage. It also comes with a Photo Capture Centre designed to make the printing of images as simple and easy as possible, while it has a 250-sheet paper feed system for that added touch of convenience. It’s a relatively chunky product that weighs just over 7 kg, and it doesn’t have the sort of cutting-edge, full-colour, large control panel screen that newer models enjoy. It also doesn’t have a fax capability, which could place it at a disadvantage for users who require a full-service communications hub.